The Honda BR-V looks good, but there are too many things that make it look too similar to the Mobilio MUV. This is not the case with any of the other cars based on the Brio platform – the Amaze and the Mobilio have their own identities. The BR-V on the other hand, at first glance at least, looks like a Mobilio which has been given a facelift and given some new accessories. That said, the BR-V has a handsome face with the sleek headlamps, a re-imagined Honda signature wing-like chrome grille, aggressive front bumper with a silver faux skid-plate and clam-shell bonnet. The side profile with the black lower-cladding, large 16-inch aggressive looking 5-spoke alloy wheels, large doors, stretched windows with a generously large rear quarter-glass, and the roof-rails is well proportioned. The chrome handles and the chrome strips at the bottom of the doors look quite nice for a change. Many other companies can learn a thing or two from the BR-V in this matter. Move to the rear and you get to see the other important sector where designers from the company spent a lot of time. The new tail-lamps which stretch from side-to-side (the centre part consists of reflectors only, though) makes the BR-V look wider. However, the BR-V is not an SUV, and is at best a crossover. It does sit higher than the Mobilio though, with a ground clearance of more than 210mm the BR-V is at par with the Renault Duster AWD. The Honda BR-V gets black-and-grey interior across all variants of the crossover. The top-of-the-line VX variant gets a leather pack – the seats, armrests on the doors, and the steering-wheel wrap are all leather. The steering wheel with the multimedia control buttons, the ‘3D’ instrument cluster, a slab-like face for the centre-console with piano black trim, rectangular A/C vents, silver highlights, the integrated multimedia console and the climate control system – everything looks familiar, in a good way. The piano black trim on the centre console is a dust and fingerprint magnet, and can disrupt easy viewing of the multimedia screen or the climate control display. However, the manual-adjust lever for cliimate control re-circulation button stands out like an eyesore. The seats are comfortable enough for short to medium duration drives, but can be painful if used for long inter-city journeys. That said, there is no dearth of legroom, knee room, head room or shoulder room in the front two rows but short seat bases and thinner than usual seats mean that your thighs and bottom will be uncomfortable if you sit on these seats for hours on end. While some passengers may feel the heat, thanks to the uncomfortable seating, the climate control system can keep things cool in the cabin. As the BR-V is a big crossover, it gets roof-mounted A/C vents to keep the second and third-row seats cool. You can slide and recline the front two rows to get the best seating position, captain seats in the second row would have been more appealing though – Honda is not offering captain seats on any of the variants of the BR-V, but accessories dealers around the country should be able to offer you alternatives soon after the crossover is launched. The third row of seats, as was the case with the Mobilio, should be used to seat children for longer journeys . Getting into the third row is easy as the second-row seats fold forward with ease with a use of a single lever. Even with the third deployed, the BR-V has a decent luggage space of 223-litres. This can also be improved if you fold forward the third-row seats, which frees up 691-litres of space. Features is a section where the BR-V is most disappointing. For a crossover that is going to cost you more than Rs. 10 Lakh, ex-showroom, it does not offer a touchscreen infotainment system, rear-view camera, auto-folding mirrors, auto-dimming IRVM, auto-headlamps, cruise control etc. Some of these features could have been overlooked if the cost cutting around the car wasn’t so obvious. The metal and the plastics flex on touch, the plastics on the inside feel rough and belong to a segment much lower, the sound deadening material used is inadequate, especially in the diesel variants. 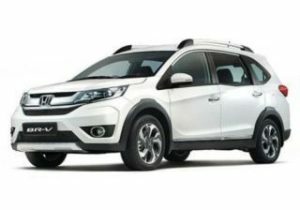 The Honda BR V is powered by two engines, a 1,497 cc i-VTEC petrol and a 1,498 cc i-DTEC diesel. Power and torque generated in the petrol variants of the MPV are 117.3 hp at 6,600 rpm and 145Nm at 4,600 rpm. On the other hand, the diesel produces 98.6hp at 3,600 and 200Nm at 1,750 rpm. Both engines are responsive but there is a bit of clatter from the diesel engine in the cabin.The Honda Mobilio has two gearbox options, a 6 speed manual for the petrol along with a CVT automatic transmission. The diesel engine can only be ordered with a 6-speed gearbox. Both units are refined and gear changes are seamless and the light clutch adds to driving convenience. However, given the increasing popularity of automatics, the diesel engine too should have had one. The drive quality of Honda BR-V is enhanced with electric power steering, and easy accessibility to control lever of acceleration, clutch and brake, assuring stress-free long drives. The strong build quality, tough suspension and the superior quality of interiors offer great comfort to the occupants. The Honda BR-V is a great handler. Especially the petrol engine. Ride is not too supple and not too stiff and the steering offers right amount of feedback. Throw the BR-V petrol into a corner and you would come out at the other end gracefully. However, this car is in no way meant to do lap times. On the safety front, the BR-V gets ABS and dual front airbags as standard across all variants. This is a good move considering the car priced slightly higher. Honda BR-V is a compact SUV from the brand Honda making a grand entry into the premium compact SUV segment. The Honda BR-V price ranging from Rs. 7.9 to 12.9 lakh (ex-showroom, New Delhi) encourages the customers in choosing from a wide range of options. Open Rhinoplasty Or Closed Rhinoplasty: Which Technique Is Best?